ETHICS- My choices concerning feeding, housing and breeding my rats, plus breeding plans and goals. Rats need a constant source of food and water. Because of the scale of my rattery, I use wire mesh to enclose my rat's food(so that they do not stash it and waste it by weeing on it) and have it always available. I also a gravity-fed water system to supply fresh water 24/7. My rats diet consists mostly of "Cummins" brand rat and mouse cubes. These are little cylinder shaped pellets formulated to be an entire diet for a rat. They get everything they need nutritionally from these pellets and don't need anything else. But for my enjoyment and to give them some variety and keep things exciting, I give them lots of extra treats. These are usually my table scraps and fresh fruit and veg. 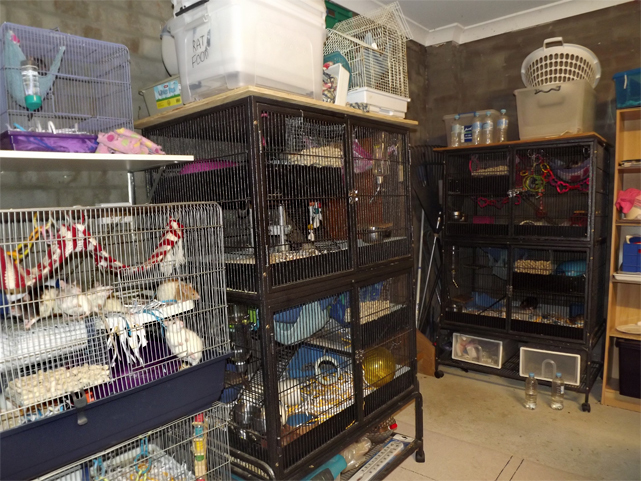 Though my rats used to live inside in cages for many years, due to the recent expansion of my rattery size and also renting out our upstairs rooms in our house, in May 2012 my rats were moved into the built on brick garage which is fully enclosed and quite cozy. I was a little worried about the heat in there, but on a 40+ degree day it doesn't exceed about 30 degrees in there, on those days I still use fans and ice to cool them down, as that's still a little hot for them. Generally it stays between 10-25 degrees in there though. In July 2013 I switched from using the Ferret-Kingdom cages you can see below to using a 'rack system' which I made myself. I made the switch mostly for convenience, as with the number of rats I have at the moment (60-70) the cleaning of the cages was taking me over 6 hours a week! (It is now cut in half) But also the racks enable me to better organise my breeding projects, I'm able to leave my rats for days unattended if needed(though I love seeing them every day), and also it is reported that rats health improves in tubs because the enclosed environment stops breezes which negatively affect their health, I thought I'd give it a try. Considering that rats are naturally burrowing animals living mostly in small confined tunnels and chambers with little airflow and no open spaces, this seemed a little more natural. ...I would eventually like to go back to having a smaller amount of rats kept inside in cages though, as this is how I most enjoy spending time with them. Hopefully in a few years time when I am completely happy with the quality of my breeding animals I can downsize my breeding set up and bring them inside once more. 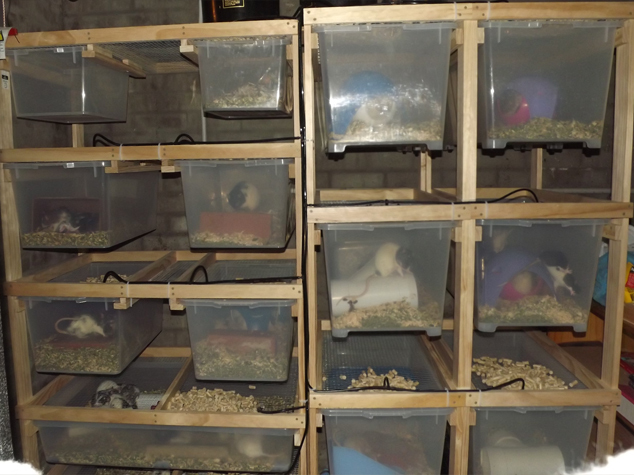 Here's a photo of what my 'rat room' used to looked like in January 2013. I enjoyed the cages and plan to go back to them one day, but they were not suited to the numbers I need to keep to see improvement in my rats at the moment. I plan to breed for the continued and bettered health of the species before anything else. Although markings and coat types will be taken into consideration when chosing a breeding pair, only rats of excellent health and great temperament will be chosen to breed in my rattery. I started off my rat experiences with pet store bought rats because I didn't know that at the time there were rat breeders out there. But pet store rats are a lucky dip, some have fine health and others not so fine at all, because often pet store rats are bred for profit only- with no intention to breed good health, longer lives, or outstanding temperaments. It is because of my experience with a few of my pet store bought rats and their health problems that I have decided that I'd like to turn my love for fancy rats into my own rattery- to help, along with other breeders, in bettering the species as a whole. All of my breeding rats have to pass my ongoing assessment of their health and temperament for me to consider breeding them. If they sneeze and do not get over it quickly, or need medicating from any respiritory reason, they will not be bred from ever. And if they cause fights, bully younger rats, or ever bite people, they will not be bred from. Sometimes these issues pop-up after the rats have already been bred for the first or second time, in these instances I will not breed from those rats again, and I will wait longer and watch their offspring very carefully before choosing to breed from them. I plan to only ever breed my females 1-3 in their life times. Their first litter will be when they are aged 5-8 months, and depending on how well they recover from their first pregnancy I will decided whether they are to have a second and/or third litter. On rare occasions I have bred a doe for the fourth time if her litters were small and she handled them well. Does will then retire from breeding after the age of 12-15 months. I will breed from my males no earlier than 4 months old, but preferrably I'd like them to be over 8 months old so that I can fully assess their possible change in temperament towards other rats and people as they age. I will never breed from a male that shows aggressive tendencies, as it is highly heriditary. Maternal aggression is difficult to avoid as it only becomes obvious once you have bred a litter from a female and she nips you, but over a number of generations of only choosing the friendliest females to breed and focusing on continuing the lines using the bubs of non-bitey mums wherever possible, this issue can be overcome in time. Male and Female babies will be separated at 4 and a half weeks old and put into the main 'colonies' to learn from their elders, then after 6 weeks old they should be ready to go to their new homes. I occationally hold on to some babies or whole litters until 12 weeks or older to fully assess which are the best choice to keep to breed the next generation. Occationally I will keep a whole litter here, not selling any, and only rehome some as FTGH when they are adults because they turn out to be not breeding material but still good pets. If some rats that I breed are sick before being rehomed, I will keep them here and I do not rehome them. I usually medicate them and try to let them lead a happy life here until they pass or begin to suffer and are PTS. On occasion I will PTS (or cull) babies who do not thrive and are very sick very young to end future suffering for both of us, this rarely happens though. If I rehome a rat and it later becomes sick in the next few weeks, I will take the rat back and offer you a replacement where possible. I will also take back without question any rat that I've bred at any age in it's life if an new owner so wishes. Here at Elliem Rattery, my plans do change and evolve as I go, so here I will discuss these plans. Obviously I aim to breed healthy and well temperamented rats, but these are my goals regarding colour, pattern and coat type. (a line consists of numerous generations of inbreeding. Most consider a family project a line after atleast 6 generations of breeding relations together, before this stage I prefer to call them "Projects". Inbreeding is a good practice when breeding rats, faults in the genetics are brought up straight away and can be erradicated rather than hidden and passed on. Inbreeding does not create problems, it only shows up problems which are already there. There is not the same stigma with inbreeding rats as there is with other animals). -Standard Variegated Blazes- started with Kiah x Romulus. Nov 2013 - This line has improved somewhat in health in the past year, though there is still room for improvement of course. Kiah passed away at 3 years old recently, a good run for a rat these days. I have expanded my breeding numbers and am keeping them all until about 6-8 months to decide who is best for breeding. -Silk Variegated Downunders- started with Domino x Blaze. Nov 2013- Unfortunately I haven't been as happy with the generation born earlier this year as I have with previous generations. Their health is still ok, but I have been trialing not handling babies to see who is naturally the friendliest at 5-6 weeks old, and a number from this generation were a bit more standoffish than I would have liked. Also there is still a little maternal aggression in this line. But I have chosen some really lovely boys and some bold girls to keep, in a few months I will put them through many personality tests to choose who is best to breed from. It will take a few more generations of selection like this, but I'm confident that I'll get consistant temperament results eventually. I have decided, at least for the time being, that I will not be aiming to breed rexes or double-rexes, as in my experiences, though they are some of the cuddliest rang-doll rats I've ever met, they don't have very good health and tend to live short lives. There are some rexes in QLD which seem to have promising health, and in the future I may look at trying to obtain some rats from these good QLD breeders, but for now my Rex breeding plans have been dropped. Unfortunately after just two generations... I did not find chocolates that interesting, and their health and personalities were average at best, so I chose not to continue them so that I could focus more on my other main projects. Although I love the colour, I never had much luck breeding the 4 blues that I've previously owned. Two were breed quality but wouldn't reproduce for me, and the other two were not breed quality due to being very skittish and hard to handle. So I've decided for the time being to not bother trying to start a blue project. There were too many health problems and aggression in the spotted whites that I bought, I bred a few litters and found the maternal aggression was too high to bother working with on my small-medium scale set-up, so I dropped this breeding project. I do occationally get some BEW's with small spots in my other 2 lines, but these are not related to the spotties that I bought from elsewhere. The Powderpuffs I have here are generally of huge size and usually great health, but unfortunately they had some serious reproductive issues. I only managed to get litters by outcrossing, which diluted the long coats. I also had a few older females develope uterine tumours, so after this discovery I decided to retire this project and keep the remaining rats as pets.